For all the greetings occasions, we’ve got you covered when you need a message, wish or quote. 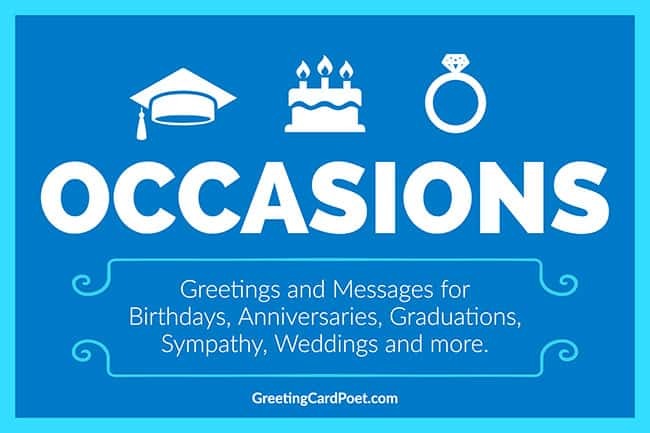 From special events like graduations, baby showers, anniversaries and others, you can find a list of carefully selected greetings, wishes and quotes to fit the occasion. For holidays, go to our holiday message menu. We try to cover most every greeting card occasion. Click on the links below for ideas on messaging. You might use the suggestions for Facebook posts, card messages or even face-to-face communication. Never be at a loss for words with the Greeting Card Poet.